I thought you might enjoy an update on Lily (formerly Maisey). She is 10 months old now, has gotten a lot bigger, and is a real sweetie. People stop me all the time on the street to tell me how pretty she is! She has a lot of dog friends at our local park who she enjoys "herding" -- she likes to keep everyone on the go. She goes to playgroup evey day while I am at work and gets plenty of exercise. A few weeks ago we graduated from beginner obedience at Especially For Pets, and we are currently taking an intermediate level class. She is really smart! At a few local dog events we have had the chance to sample agility and Rally-O, and Lily enjoyed both. When she gets a little older I am sure we will be doing more of one or both. I have been trying to get her interested in frisbee but so far she would rather chew one than chase one. Lily gets along really well with her cat "sister," too. We are still working on some separation anxiety, but that is improving with time. 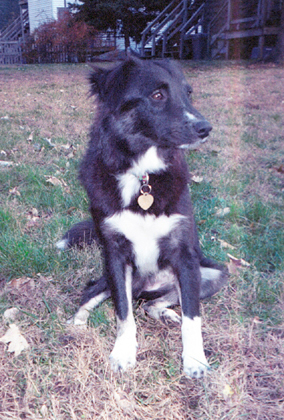 We hope someday to meet her sister (Maggie) who came up with her from NC. She is a great little dog and is well loved. I thought you might like an update on Lily (formerly Maisey, adopted 8/2003). 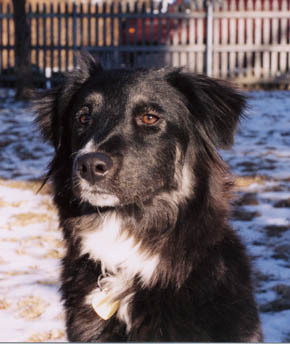 She turned 1 in January and recently passed the CGC test at Especially for Pets in Sudbury. We will be starting agility in the spring--I think she will really love it. She enjoys playing with her new friend Sophie, another Save A Dog (formerly Onyx), who lives down the street. Lily is a great little girl. I was wondering if you might pass along my contact information to the people who adopted Maggie, her sister (they came up from NC together). I would love to compare "notes" with them and perhaps get the girls together sometime. I have attached a recent photo. She is looking so grown up!